Our directors Marcy Kornreich and Jamie Marks both grew up at the camp and have spent many years working together at CYJ in a variety of administrative roles. Most of our staff are former campers who come back year after year. Our alumni network is fiercely passionate. Our team of administrative adult staff has worked with us for years and our counselors are top-notch and well-trained; most are former campers who are eager to provide the same fantastic experience they had at CYJ as campers! Plus, about 90 percent of our campers return each summer. We insist on kindness, honesty, fairness and respect for each and every person in camp. Every year that campers return, we provide them with new and engaging opportunities for leadership, teamwork, role modeling and responsibility. Our counselors are chosen for their dedication, energy, teaching skills and commitment to children. We believe in positives, not negatives: patience, non-judgmental feedback and leading by example. CYJ is a place where children and adults alike listen and feel heard. This spirit of acceptance, combined with clear guidelines and expectations, helps to create a wonderfully warm and supportive community that is truly like a "a home away from home." From the start, we provide tons of support and assistance! We see our role as a partnership with parents. We encourage a personal connection with every parent because we want and need your feedback to ensure your child's success. We are ALWAYS willing and happy to talk to you about your child, whether it's before, during or after camp. We understand and deeply appreciate your trust in us. We want you to be secure in the knowledge that your child is having a fantastically fun, memorable and safe experience. Our camp always goes the extra mile. We consistently debut new programs while lovingly maintaining traditional favorites. We encourage an on-going dialogue with our campers, our staff and our parents, in order to continually improve and stay relevant. Our commitment to a digital-free environment (no cell phones, iPods, computers, etc. for campers OR staff) ensures that for perhaps the first time in their lives, campers (and staff!) are connected to each other, not their devices! We are one of a select number of camps nationwide accredited by the American Camp Association, a national organization dedicated to serving the needs of children in all camp settings. CYJ IS A SPECIAL PLACE! Camp Young Judaea, founded in 1939, serves children ages 8-15 (completing grades 2-9). Located on 168 scenic wooded acres on the shores of Lake Baboosic, our waterfront features two power boats, canoes, kayaks, sailboats, paddle boards, and row boats. Natural beauty abounds with hiking trails, plenty of green space and places to play and relax! Camp facilities include eight tennis courts, several playing fields, basketball and volleyball courts, archery and riflery ranges, broadcasting/video studios, outdoor adventure course, a large modern dining room, sturdy wooden cabins, and several other spacious indoor facilities, including a gym/theater, arts and crafts studio, and rec hall. Shabbat services are held in a beautiful grove, sheltered by towering pine trees. 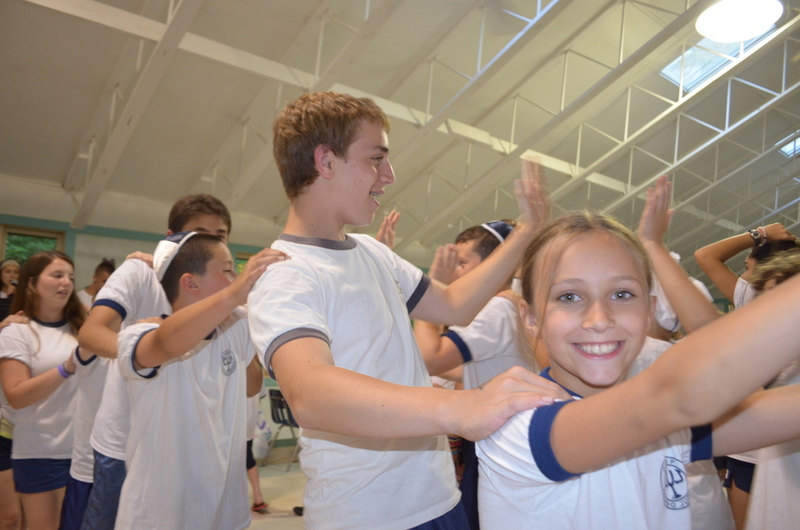 Music, dance, drama, and Judaica are integral parts of our program. If you'd like to learn more, please click on any of the photos below. Or feel free to call us for more info! We love helping parents and campers decide whether we're the right match!